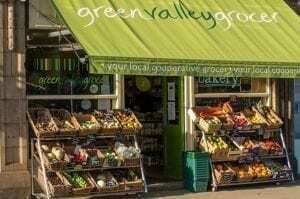 The Green Valley Grocer is a co-operative and community-owned shop. They aspire to purchase 50% of their produce from local growers or producers within a 30-mile radius. 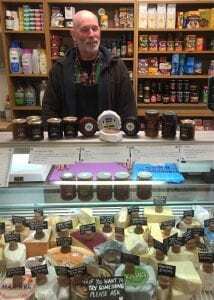 Selling fresh fruit and vegetables, wet fish, artisan bread from The Handmade Bakery, wholefoods from Suma, a large range of cheeses and dairy products, and of course the full range of Shaws chutneys, relishes & sauces. In season, they buy goods from Local (within 30 miles) and Superlocal (within 5 miles) growers and producers. In the shop, there is real pride in providing excellent customer service and the staff are very knowledgeable. There are over 300 members of the co-operative. If you’d like to become a member you can do so via their website.